Happy December everyone! are you getting ready for Christmas? Need I say we are just 23 days away now. I am making some winter theme cards. 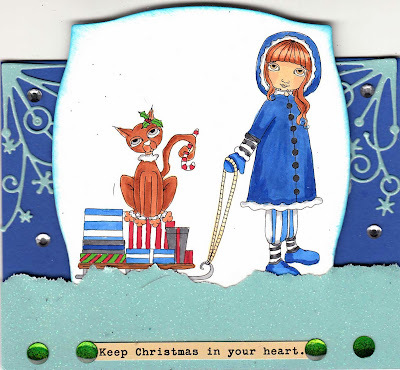 This fun image comes from Kathy Cyr and is called Sledding. So adorable. I decided to color her up in blue and make a blue card to match. The card is meant to stand up on the desk and will fit perfectly in a 5.5 in envelope. Can't you just imagine this pair out and about handing out Christmas cheer to everyone? Hope you will check out all the Frances Mary and Cornelius images as well as some of the gorgeous lady stamps from Kathy Cyr at the Queen Kat store!